On Tuesday, July 7th, 2015, I had the privilege of speaking for the DBA Fundamentals Virtual Chapter. Thanks to the 375 who attended and to all who will be watching the recording. While I can’t read the comments during my presentation (way too distracting), I did enjoy reading the questions and comments that were sent to me. Below you will find answers to the questions I was sent. 1. Are you talking about SSRS 2016 or 2014? I was presenting using SSRS 2012, but the demos and discussions applied to versions 2008 through 2014. 2. When should you use SSRS RDL vs. RDLC (Remote Definition Language Client-side)? Should you be able to invoke RDL from a web app (say web forms, asp.net) just as easily as RDLC? The difference is RDLC reports will run on the client side. They don’t need to access the report server. 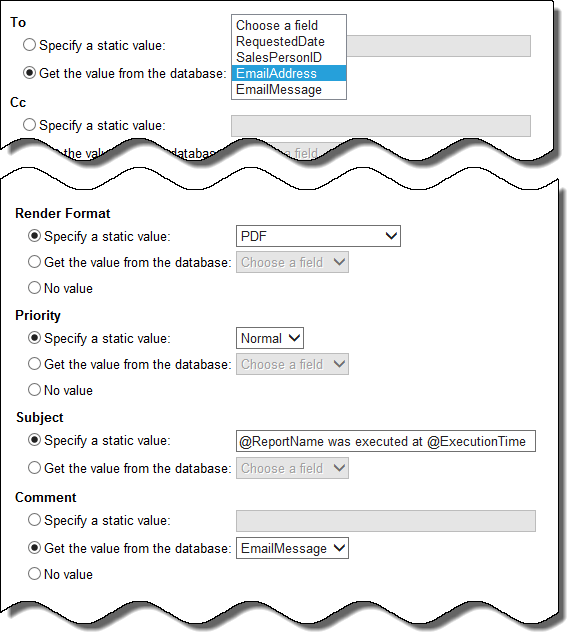 RDL reports can be invoked on the client side, but they are rendered on the report server then delivered to the client. The RDLC reports would be part of an application and will take up client resources to generate. 3a. What is the difference between SSRS and Reports Application in Visual Studio 2010 (full version)? 3b.Why use SSDT over Visual Studio? I liked both of these questions, and they have the same answer, so I wanted to group them together. SSRS (SQL Server Reporting Services) files are generated in two applications, Report Builder and Visual Studio. Report Builder exists on the Reporting Server called Report Manager. Visual Studio is the Integrated development environment (IDE) that you write code in. Microsoft created (at least) two distributables for Visual Studio. The one that Application Developers, is only known as Visual Studio and the one that comes with SQL Server called SQL Server Data Tools (SSDT). The IDE is the same for both of them. When they co-exist on the same computer, they will be integrated. If you only have the SSDT version, then you can only create SSRS, SSIS, and SSAS projects. You can also download over project types for Visual Studio, such as PowerShell projects. Note: For SQL Server 2008 it was called Business Intelligence Development Studio (BIDS). It was renamed to SSDT in version 2012. The answer to this depends on your comfort level for creating reports. Report Builder is meant for the power users in the business. SSDT is meant for developers. I’ve personally never used report builder, but that’s because I’ve been writing reports since before Report Builder was introduced. If you continue to create reports in Report Builder, then take a look into generating Report Parts. Those were introduced in SQL 2012 and are supposed to be “building blocks” to help create more complicated reports within Report Builder. 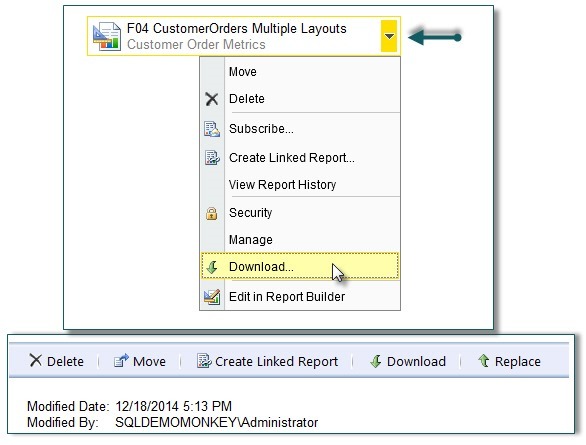 In the Report Manager, pull down the menu to the right of the report and select download. You can also go into the properties of the report and see the download option in the toolbar for that report. 5. How did you link the two datasets? The two datasets weren’t linked like you would see writing a JOIN statement. They were filtered using the same parameter. Datasets can’t be joined together within the report. 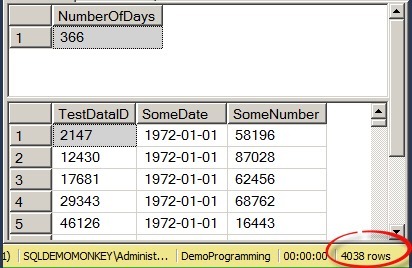 There are a couple of functions introduced in SQL 2008 R2 that allow you to reference a single value from another data set, but that is as close as they have gotten. 6. How is the security configured within the data sources ? How can the double-hop authentication issue be avoided when accessing data from multiple servers ? You have 4 different security options that you can use. Books online can tell you the details on each of them. I personally use a SQL Server login, only used for reports to access the data. I then use windows authentication to access the reports themselves. Each data source can connect to a different server and even use a different SQL Server account. Send me an email if you still have questions on this topic. 7. I saw that you saved the password for the data source (during development). How can we ensure that it is encrypted when deployed to the server? I would have to do some research to see how the password is sent during the publishing event, but I do know it is stored encrypted. In fact, the Connection String, UserName, and Password are all encrypted. Go into the ReportServer database and run this query: SELECT * FROM ReportServer.dbo.DataSource. If you are still concerned about the Data Source during the publishing event, then you can create the data source manually in Report Manager. As long as the SSRS project has the property “OverwriteDataSources” set to false, the data source will remain the one you manually created. 8. What if you want to show multiple databases (in your report)? You can create as many data sources as you need and they can each point to a different database on a different SQL Server. If you are gathering diagnostic data, like we were doing in the demo, then you might want to consider a two step approach. The first step would be to have an SSIS package or a PowerShell script retrieve the diagnostic data from each server on a schedule and save the data to a central database. 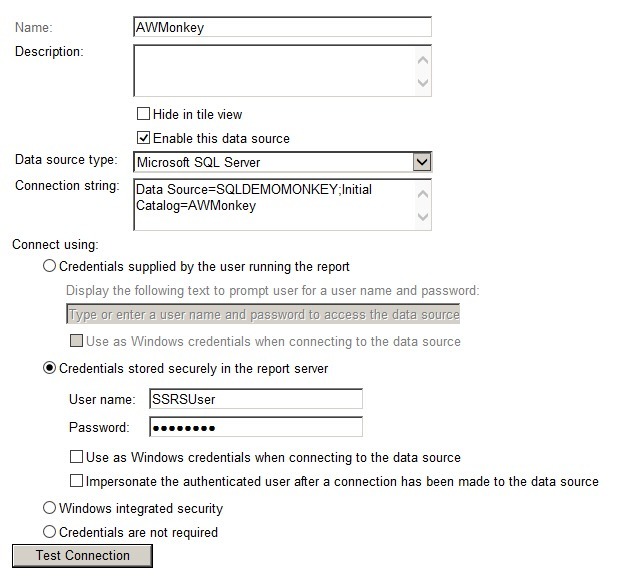 Then you can have the report pull the diagnostic data from that central database. 9. Can hidden parameters have values passed to them, for example: can a hidden parameter list containing state names have “CA” passed to it when the report is opened? Yes. That would be done in the parameter properties on the report in the Report Manager, from code, or from another report. You can also create Linked Reports in the Report Manager and change the values of the hidden parameters. 10. Is there any difference between previewing the report than just running it by r-clicking on the report? 11. Can you set border style in your template? So it’s not there at all? Yes. If you were to save a new tablix in the template with the borders set to None for each row. Then you would copy that tablix for each tablix you need. Unfortunately you can’t modify the actual tools in the toolbox. 12. 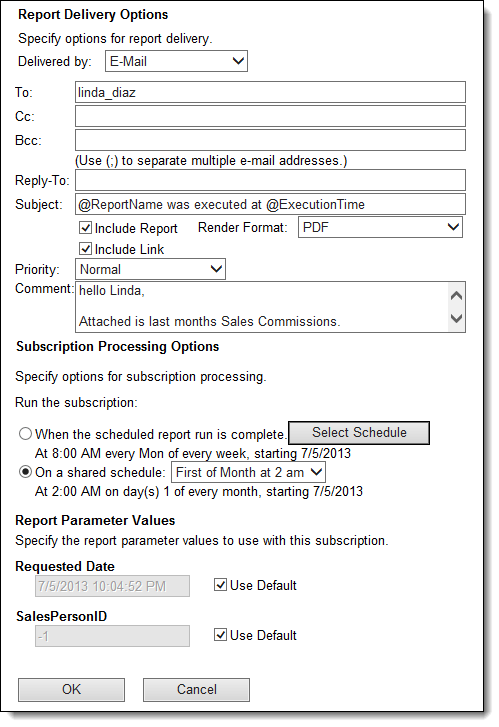 Any strategy to fine tune multiple drop down option/filter in SSRS report. 1. Make sure that the Queries that are populating the drop down lists are FAST. 2. If the drop down lists are filtering each other, known as cascading parameters, then have them filter within the report, instead of making a round trip back to SQL Server for the filtering. This would be done by applying the filter to the 2nd parameter in the filter property instead of attaching it to the parameter property. 3. Make sure that the predicates of each of the queries and the final data set have proper indexes. 4. If the queries that the drop down lists are using are really slow due to too many JOINs, then consider using an SSIS package to create a static table that is updated every X minutes/hours with the latest data. Then use that table for the parameter lists. 13. This is not the question you are looking for. Move along. Move along. 14. How to display a message in the report if the dataset doesn’t return any records ? This is an excellent question and the answer is not used enough. Set the NoRowsMessage property on the tablix (Table/Matrix/List) control. You can get to it through the property window. The value of this property is displayed when there is no data to show. The value can even be an expression. 15. How to get a big report to limit to 4000 records but well distributed in terms of days in a month? I would love to have more information on why you have this requirement. It is an interesting one. Here is what you can do. Note: It will slow the query down though, so make sure you have good indexes on the predicates. 1. I have 1 million rows of random dates and numbers. This happens to be a very narrow table. 2. I use the ROW_NUMBER() function. It will give a sequential number to each row based on the partition. I partitioned the data based on Year, Month, Day. If your date field does not have time, then you can partition based on the date field. Within each partition, the data is sorted by Date then TestDataID (the PK). This will help guarantee the same order each time. 3. I determined how many days were in the range of dates I’m selecting from, divided 4000 by that number, and select only those row number values per date. This will provide an even distribution across days. 4. Since you can’t guarantee that the number of days will divide evenly into 4000, you need to either have less than 4000 rows returned, or more than 4000 returned by adding 1 to the number created in step 3. 16. With subscriptions is it possible to make one subscription to use the current fiscal month to generate report vs. creating 12 subscriptions for each fiscal month? Unfortunately no. You can do it based on calendar months, but not based on fiscal months where the first day of the fiscal month may not be the 1st day of the calendar month. I would love to see this feature. If this is a must have requirement, then email me and we can talk about some “creative” solutions. 17. What are the different security roles on report server side? The SSRS development team were kind enough to add the definitions on the security screen. 18. Can you append the date/time to the file name that gets created with a subscription that saves to a fileshare? Yes. Add the @ExecutionTime parameter to the filename. 19. How do you set-up the email option for the subscription? First your Report Manager needs to be setup to send email. I usually have my Sys Admin help me with that. If you use the standard subscription, then the setup screen will look like figure A below. If you are creating a data driven subscription, then the setup screen will look like figure B below. Either way, you need to set all the properties. Then select a schedule for the emails to go out on. I would highly suggest using Active Directory groups for the To list. This make is easier to manage when people change jobs. You may also want the email to go to yourself for a few days or weeks to make sure it is going out as predicted. I wanted to give a shout out to Glenn Berry for letting me use his diagnostic queries for my demos. You can find the full diagnostic script, per SQL Version here on Glenn’s website. The downloads for this presentation are available on the DBA Fundamentals Meeting Archives page and will be available on my website under Resources shortly.